Table set for family lobster feast New Brunswick 2005. 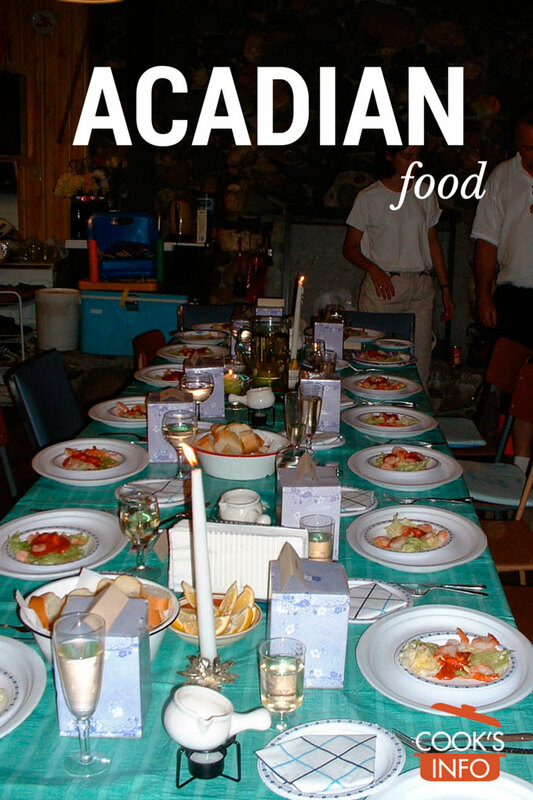 Acadian cooking is country-class food, accompanied by lots of bread, with main dishes often being one-pot meals. The Acadians are French-speakers who live in the French-speaking areas of Atlantic Canada. This takes in parts of Nova Scotia, New Brunswick, Iles-de-la-Madeleine and Prince Edward Island, as well as parts of Maine in America. They have their own, very unique food heritage, which evolved away from that of France, while staying different from that of its larger French neighbour, Québec. They have their own flag to represent the Acadian nation. Their traditional dishes remain very popular with them — traditional foods such as Poutine Râpée is available at fast food places now, and Pâté râpé (aka Chiard or Pâté à la râpure) can be ordered in restaurants there. Fricot with doughboys — stew with fluffy dumplings — is usually still just made at home. Pork and beans (“fayots au lard”) are also a favourite. The beans are sweetened with sugar and molasses at the table; the sweetener is never put in as an ingredient, as you would with Boston Baked Beans, for instance. Pea soup (“soupe aux pois secs”, or more commonly, just “soupe aux poix”) is made in the winter from dried peas, with salt pork in it. Turnip soup (“soupe au navet) is made with turnips, potatoes and salt pork. The main meat used is pork (fresh, salt-pork or bacon) and poultry. Fish may be boiled or fried. Crab and lobster are boiled; mussels are steamed. Domestically-raised foods were traditionally supplemented with game, fish and seafood. Meat pies are made for holidays, from usually a mix of two meats, pork and chicken, or pork and hare. Sometimes the pies are made with a yeast-dough crust. Pieces of pork fat are scattered throughout dishes, even desserts. Dairy products used are milk, butter and cheese. 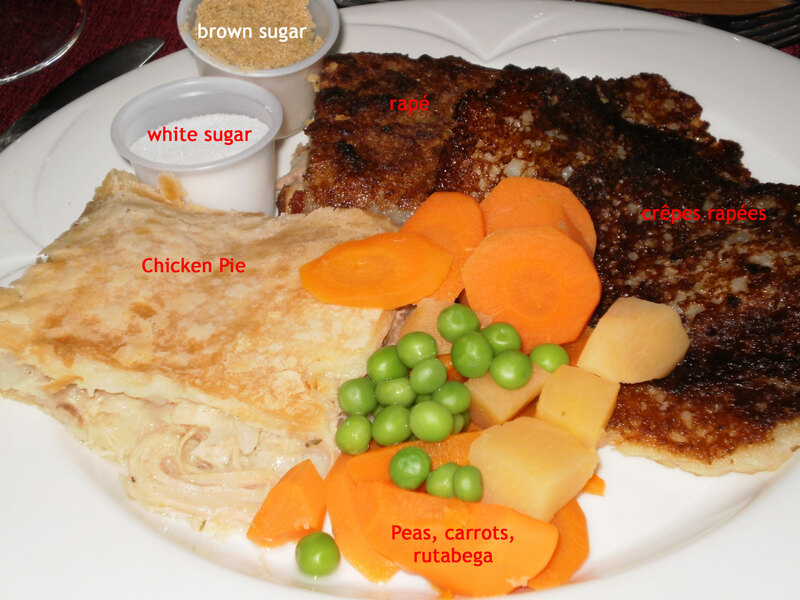 Popular vegetables are potatoes, cabbages, turnips, beans, and peas. Most vegetables are simply boiled, except potatoes which are prepared in a variety of ways. Potatoes are even used in making some desserts. The preferred method of cooking is boiling or simmering. The Church calendar was very important traditionally; it also coincided with the Acadians agricultural year. On Epiphany, they hold large get togethers for singing, dancing, and card-playing. Pancakes are made at Candlemas. Lent was observed — not many parties held during it. On Palm Sunday, they used cedar or pine branches instead of palms. The branches that were blessed were used to decorate and protect houses and fishing boats. On Easter Sunday, boiled eggs are traditionally served for breakfast. On the day of the Feast of the Holy Sacrement (aka Corpus Christi, aka “Fête-Dieu” in French), the towns would parade a consecrated host through their main streets up until the mid 1900s. Their national feast day is 15 August, the Feast of the Assumption, marked also as Acadian National Day, with a large parade. In some regions, a dish (called “blé d’inde lessivé”) is made from dent corn, similar to hominy in the American south. The dried corn is boiled in water with lye in it, then rinsed, then simmered with water, pork or chicken, onion, salt and pepper. It may be served with molasses. The number one seasoning in Acadian cooking is summer savoury. Acadians who are away from home will complain how hard it is to get, and have relatives send or bring it to them. Molasses is used both as an ingredient and a garnish — it can be served with any dish, savoury or sweet; some even like it with fried eggs. Brown sugar is also popular. Acadians use some spices in ways that almost seem Medieval now in where they appear: for instance, in meat pies you might find coriander (called “poivre gent” in Acadian), caraway, cloves and mace. This hearkens back to their cooking splitting off from France in the early 1600s, before the last of Medieval cooking habits were thrown off. Other flavourings include thyme, onions, garlic, salt, pepper, and salted herbs. There are slight variations in recipes in various areas. For instance, in a few places, a chowder is the same as a fricot (a braised or stewed mixture.) In other places, such as Cape Breton and in Îles-de-la-Madeleine, there is a clear distinction: a chowder (“Tchaude”) is with fish; a fricot is with meat. The usage of rice did not make it into Acadian cooking on Prince Edward Island. A cheese would be made after a calf was slaughtered by saving its stomach intact, filling it with milk, and hanging it up for several days.The milk in the stomach would turn into cheese. Very large poutine râpées are made with no meat in the middle, wrapped in cloth and boiled in water. Vegetable soup is called “soupe de devant de porte” (front door soup) because that was the site of the vegetable garden, and it implied whatever was ready to pick at that time. Flavourings used include salted herbs, onions, and summer savoury. They hold Mardi Gras parades with snow mobiles in them. The French started settling in Acadia in 1604. They created a dyke system called the “aboiteau” to drain marsh water back into the sea, to reclaim land from the sea. In 1672, Acadia had also been attacked and claimed by the Dutch under a Jurriaen Aernoutsz, who named the land “New Holland”. The Dutch had even named a Cornelius Steenwyck as governor of Acadia in 1676, but never got around to doing anything about it other than on paper. The land came under British rule in 1713 under the Treaty of Utrecht. The Acadians had sworn oaths that the wouldn’t fight the British, but the British military pushed harder and wanted them to go further and actively fight against the French, which they wouldn’t do. And in any event, the Acadian’s declaration of neutrality appeared dubious when some 200 of them were found by the British inside the French-held fort of Beausejour when they captured it in 1755. Britain wasn’t sure of its position in North America at the time, it was losing to the French in the Ohio valley. Subsequently, the British asked them twice to swear an oath of loyalty to the Crown; they refused both times. In 1755, Britain decided to exile the population from the land. Of an estimated population of 15,000, around 75% were captured and deported; the rest literally hid in the woods when the British troops came to seize them. The exiles were even forced to leave the smallest of personal possessions behind on the shores in Acadia because the boats were so overcrowded. Many were taken to Louisiana by the British, where the descendants of those who stayed there became known as “Cajuns”. Others were also exiled to other British colonies in what is now America, such as New York, Virginia, Georgia, etc. The provisions were limited on the ships: 5 pounds of flour, 1 pound of pork or beef per person for each 7 days they would be on board. But owing to overcrowding, many people got far less food than even that on the voyage. Henry Wadsworth (1807-1882) wrote his poem “Evangeline” about the expulsion. In 1764, the British gave permission for the exiles to return. The English – French war in North America, part of the Seven Years’ War, was over, and they weren’t seen as a threat. Many when they came back went largely to New Brunswick, as their farms on Prince Edward Island and in Nova Scotia were occupied by Scottish settlers who moved in and took over their lands. They became a displaced people, with no actual land boundaries to call their own, like gypsies, or Jews until the establishment of Israel. For a time, they had to get by without priests. They’d hold “white masses” in which they’d just gather to sing and pray, with no consecrated host present. Whenever they did run into a priest, they would have the priest “regularize” the marriages that they’d held, and catch up on the baptisms. The Acadians have been recognized by the United Nations as a distinct people and nation. They are still trying to survive in land that still essentially remains under English-speaking rule. They have never been compensated by the Canadian government, which took over from the British, for their loss of lands. Beef wasn’t eaten much; the cows were kept for milk. They kept sheep, but didn’t eat much mutton — the sheep were kept them for wool. And chickens were valued and kept alive for their egg production. Consequently, up until the mid 1900s, pork remained the most important meat for them. The pigs were slaughtered around the start of December. Most of the pork would be salted, except for a bit eaten fresh as a treat, and some of the offal was made into “pig sauce”, and the rest made into sausages and head cheese. Pork, fish and cabbage were salted to preserve them through the winter. Farmers supplemented their food supply by becoming fishermen at times. Cod and herring were popular, because they could be easily preserved by salting. In season, they ate eel, mackerel, and smelt. Fish was usually braised, stewed or poached. The men also hunted bear, beaver, woodchuck, porcupine, squirrel, moose and deer to supplement their diets. And in the winters, almost all Acadian men in the 1800s worked in logging camps to make extra money. Raisins and rice (sic) entered into their repertoire early through trade with the Antilles and Brazil; they also acquired their beloved ingredient, molasses, through trade up the eastern seaboard. No formal commercial books on food in the Acadian tradition were printed until recent times, but the food heritage was preserved in written recipes passed down in households. Potato Rapé. One piece baked in a baking dish with a layer of salt pork. Another cooked up as a potato pancake, with no meat in it..
Acadian French sounds quaint to some because it’s French as it was spoken in the 1600s, particularly in the Anjou and Poitou regions of France. For instance, for dried beans, instead of “haricots secs”, Acadians use the old French word, “fayots”, from the Provençal word “faiol”, from the Latin “faseolus”. A chowder is called “tchaude” instead of just the standard French “soupe aux poissons”. Brooks, Walter & Patricia. Mid-ocean Truros where time stands still. Cape Cod, Massachusetts: Cape Cod Today. 30 August 2005. Decker, Bill. The Other Acadians: In northern Maine, Acadians struggle to preserve culture. Lafayette, Louisiana: Lafayette Daily Advertiser. 1997. Cormier-Boudreau, Marielle. La cuisine acadienne. In Labelle, Ronald et Lauraine Léger. “En r’montant la tradition, hommage au père Anselme Chiasson.” Moncton, New Brunswick, Canada: Éditions d’Acadie, 1982. Gagnon, Georges-Alexandre. La poutine râpée acadienne. Radio-Canada. 5 September 1970. Retrieved December 2005 from http://archives.cbc.ca/IDC-0-10-1401-8785/vie_societe/mets_canadiens/clip2. Laborde, Errol. À la recherche d’Évangéline. Metairie, Louisiana: Louisiana Life Magazine. Fall 2000. Melanson, Rosella. I am Acadian … And this is not a beer commercial. Fredericton, New Brunswick: The New Brunswick Telegraph Journal. August 2000.